Is it just me, or did the sales used to start a lot later? My memories of going shopping for bargains as a teen always happened quite a few days after Christmas. I didn't actually realise that Boxing Day sales were a thing until a few years ago. People getting up early the day after Christmas to battle round the shops instead of spending the day in their PJs eating chocolate seemed a little odd. This year however, as I was in Newcastle for Christmas, I decided to get up early on Boxing Day and head to Eldon Square for 9:00am. I stupidly thought that no one else could possibly get up that early. I was wrong! Whenever I go shopping on a Saturday, I'm sure to get into Toon very early and therefore always beat the crowds. It seems however that for a bargain, people will get up with the birds. Some shops were definitely busier than others, the worst being Next and Lush. I had already decided not to bother with Next - I will never understand why anyone queues up outside at 5:00am to join the chaos in such an unorganised shop. It looks like a jumble sale and they close the changing rooms! I did however want to go to Lush so headed there first. I walked through the doors just after 9:00am and it was heaving. The Christmas stock was all reduced by 50% and there were hands grabbing things from all directions. I got myself a basket and managed to get a large bottle of Rose Jam and Snow Fairy as well as 6 bath bombs and some yog nog soap. These are all things that I'd been wanting before Christmas so I was glad to get hold of everything. Feeling hot and covered in glitter, I joined the queue that was snaking round the shop and quickly realised that my little basket containing one of everything I wanted was very modest compared to others. Some people had two bulging baskets full of products and I wasn't surprised when the store announced a short while after that they'd completely sold out of Snow Fairy. I was in the queue for the tills for 50 minutes! It was worth it though as I got £52 worth of goodies for £26. Next I popped next door to Boots. I was a little disappointed by how few of the gift sets seemed to be left. I bought a DKNY perfume set reduced from £48.50 to £32.33. It included a 50 ml bottle of perfume that usually costs £48.50 alone, as well as a hand cream. 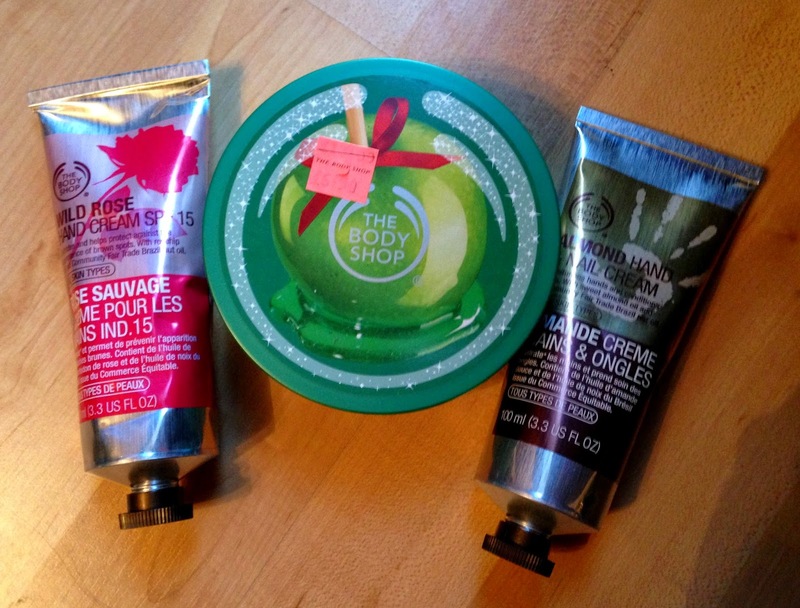 Despite all my purchases so far being smellies, I headed to the Body Shop to see what else I could find. Before Christmas I'd had a sniff of the lovely new apple scented products so I picked up the body butter reduced from £13 to £6. I also got two hand creams in Rose and Almond for £5 each. Eldon Square has recently seen the addition of a brand new Accessorize so I had to go for a nose. The store looks amazing - really large and light. I bought a pair of shoes reduced to £14.50 and a bright pink zip up purse for £4.00. The last shop I visited was New Look. I headed straight to the shoes as I knew they had some great bargains. Unfortunately all the shoes I wanted weren't available in my size but I did place a sneaky order online when I got home. 1. Dress appropriately - it may be freezing outside but it's boiling hot in the overcrowded shops. 2. Keep a clear head - don't buy things you don't want just because they're cheap. 3. Get to town early and head to the busiest shop first. 4. Take a pocket full of Christmas treats with you - whilst I was stood in the Lush queue I seriously regretted not taking a handful of Roses with me. 5. Make sure you keep your wits about you - in the Body Shop my hand creams ran through at £11 each but on the shelf they were marked as £5. Sometimes the tills haven't been updated. 6. Keep calm and smile - the shops are hot and very busy but the only way to really cope is to make sure you don't lose your head. 7. If you're not interested in the sales but love Primark make sure you head there. With not much of a sale on it's unusually quiet. I also found most of their clothes were reduced at the tills even though they were marked as full price. 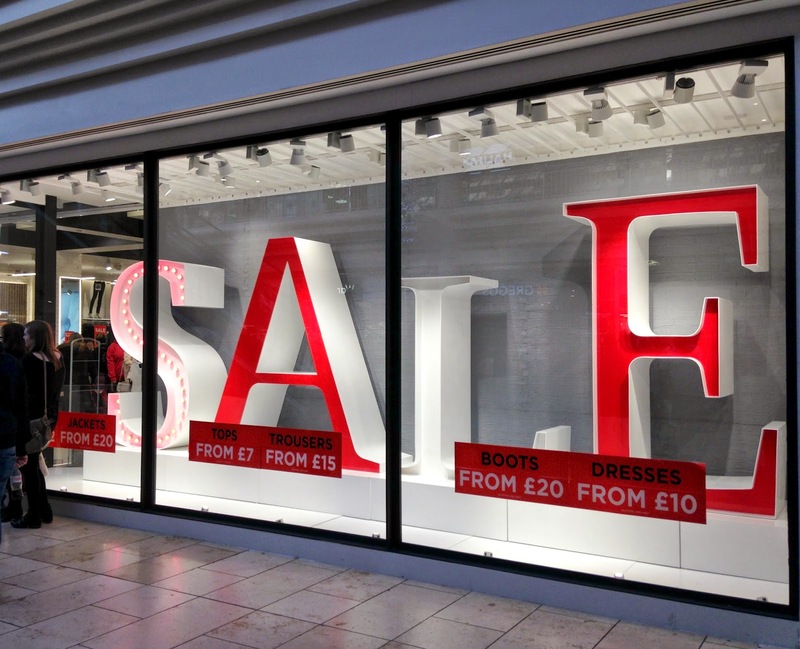 My first experience of the Boxing Day sales was an enjoyable one, I had fun, picked up some bargains and I'd definitely go again. Let me know if you found any good sale bargains. I did, thank you :) Hope you did as well? Thank you v much - I'm loving my new template, it was a long time coming! I love your new blog design, lovely! The pictures look beautiful and clear too. Onwards and upwards for 2015 - I want to make a few changes and get a new camera too! Thank you :) I just need to learn how to use my lovely new camera properly now! Hi lovely, hope you had an amazing Christmas! just thought I would let you know I've revamped my blog and changed it over to - plainsarahjayne.com please let me know what you think! :) It's also changed on bloglovin too! all the best for 2015! I agree with dressing appropriately - I remember the sales starting January 2nd when I was younger. I think if it hadn't been for wanting to head to Lush and get the good stuff I probably wouldn't have bothered getting up so early! It looks like somebody did well in the Boxing day sales! I'm very envious that you managed to get a bottle of Snow Fairy though! 50 minutes queuing?!?! You have dedication girl! My Mum worked the Next sale this year and said people started queuing for it at 2:30am. Madness! I'm glad I did all of my sale shopping from the comfort of my bed on boxing day, getting 2 bargain dresses and that's it! The online sales seemed to be pretty good this year too, I placed a £50 New Look shoe order which I'm currently waiting for! I've still never whiffed Snow Fairy!! Well done you though, great shopping. Love love love the new look of the blog too m'lady. Hope you had a marvellous Christmas. Thank you very much :) And I really need to catch up with yours! Snow Fairy is very very sweet, don't think it's for everyone! I have an irrational fear of sale shopping so missed out on both Black Friday and Boxing Day. After seeing all the goodies you've picked up though (especially the bits from Lush!) I really feel like I need to make an effort next year. Those are fab tips, especially taking a few sweets out! Thank you :) I think Black Friday would have terrified me, some of those videos on the news, it all looked a little mad! My family braved the outlet stores on the day after Christmas and was surprised at the number of "boxing day" sales we saw (we're in Texas, so the term is foreign to us somewhat). The discounts were good though, can't complain! I'm not even completely sure what "Boxing Day" means!